What is Up With That Toilet? If you recall, our family is remodeling a bathroom. I thought you might like an update on the progress of this project. First the bathroom looked like this. 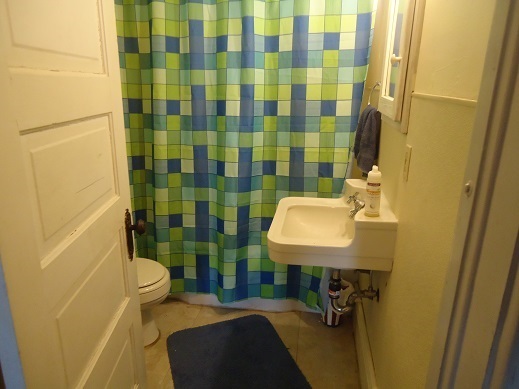 What you don’t see (or smell) in this picture is that the bathtub leaked and had nasty orange stains. The sink faucet never stopped dripping. The toilet never flushed efficiently. And the smell of pee never went away no matter how hard I scrubbed. You might have enjoyed this post more had I not shared that last part. 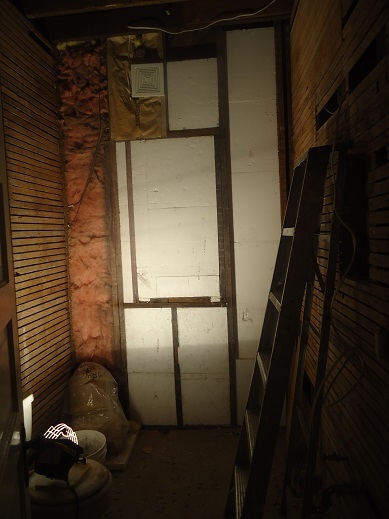 Matt gutted the bathroom, and pulled out all the lath and plaster. My house has never been dustier, but at least I have an excuse. 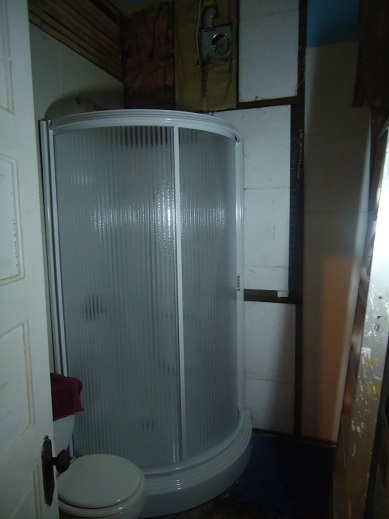 Matt got the new shower in place. It is beautiful. We used it the weekend we had a houseful of teenage boys staying with us. Then Matt took off the shower door so he could get around the room more easily to put up dry wall. All the dry wall is up now – on the walls and on the ceiling. The mudding has begun. 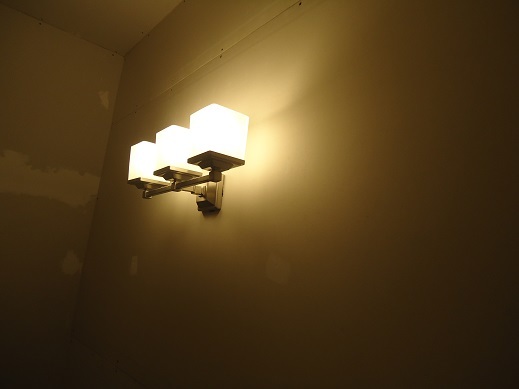 The new light fixture is in place. 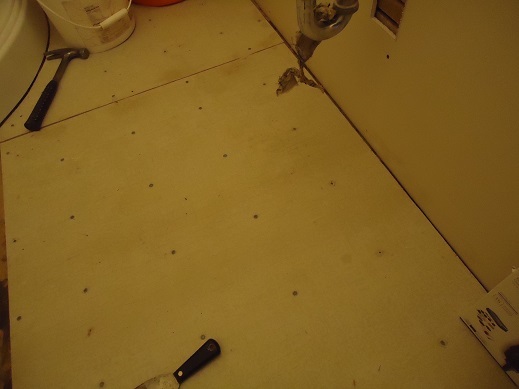 Matt has begun putting down the sub floor before laying tile. The old toilet has been removed. 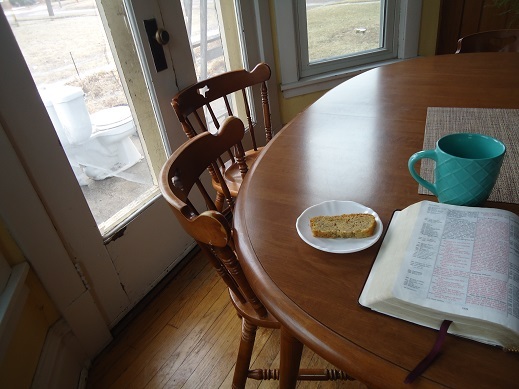 There I sat at the kitchen table, my Bible in front of me. This is the time each morning I relish in all that is good. I marvel at the quiet. I drink in the Truth. I find refreshment. I prepare for a day of service to those around me. I took a deep breath and gazed out the window at the birds that are starting to come back, a promise of spring coming to our frozen piece of the world. And that’s when it caught my eye. Here, let me just step out my kitchen door with you to the cement slab between my house and the garden. And there you have it. Our old, stained bathtub. Our leaky sink. And the latest addition: an old toilet. It’s all right there, right outside my kitchen window. They weigh a million pounds, plus it is freezing cold outside. So there they sit. Finishing the inside of the new bathroom is higher priority right now than disposing of these goodies. And really, I won’t press the issue because who doesn’t want to gaze out during her morning Bible time to look at scenery like that? I’m actually thinking of pouring in some soil and making them into planters this spring. Can you imagine anything more Pinterest worthy? Huge hugs go to my hubby who had to pause our downstairs bathroom remodel yesterday so that he could spend an entire day fixing the sink in our upstairs bathroom. Such is life, eh? Well, I guess this just about wraps up the post that has no point nor does it offer you any form of heavenly homemaking encouragement. I would end by saying, “Everytime you sit on your toilet today, think of me” – but that’s just weird. Perhaps you could tell me what you see when you look out your kitchen window? Smiling at your scenery. And your great attitude. 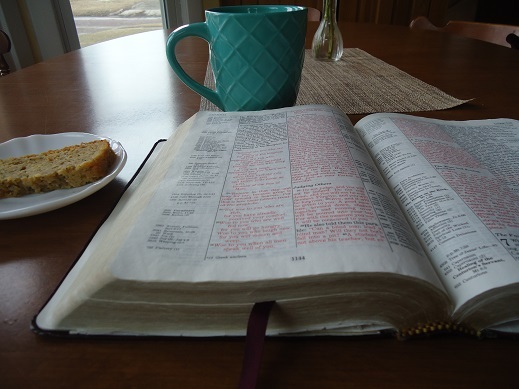 And the view of your morning study – drinking in the scriptures. Heh heh. I had to laugh when I saw this because of how similar my view is. 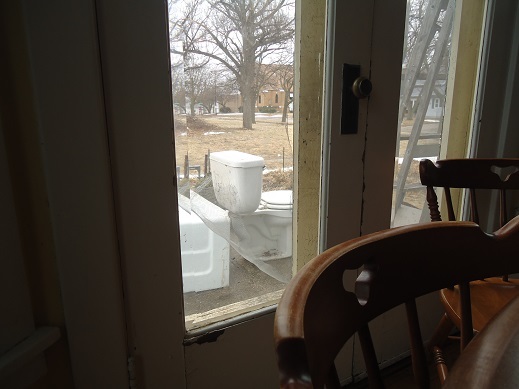 My dad is redoing our bathroom, so there is a toilet and sink/vanity on display on our porch, right outside the sliding glass window. I just keep reminding myself how wonderful the finished product will be! Thanks for a smile and giggle on this gloomy morning! Life in the trenches……gotta love it! Outside my kitchen window I see snow, lots of snow and seven ewes with wide waist lines due to lamb anytime now. It is another sign that spring is just around the corner. ???? Everyone should have a toilet to look at while enjoying their morning coffee haha. I’m sure the end product is worth it. I’m drinking my coffee and looking at more snow falling. I keep trying to tell myself that spring is right around the corner and I’m ready! Well, actually that tub will make a fine garden planter, it already has a drain hole. It is high enough to keep varmits out and the moles cannot climb thru the bottom. you could paint it to go with your veggie garden and plant some vining plants on the edge to run over the side. It would take about a quarter yard of mulch/soil but your garden center would probably dump it right in out the truck. Recycle Reuse!!!!!!! LOL! I actually grew up somewhere that “toilet garden planters” are not an entirely uncommon sight. And not fixed up, painted or somehow made to look nice. Just the toilet with flowers in the bowl randomly placed in the yard. It matched well with the beer can wind chime hanging by the front door of those houses. At least it made me laugh whenever I saw it. On another note, someone mentioned using the bathtub as a planter. That one I think would be fine if decorated well. Actually, I’ve seen really neat designs using an old claw foot tub as a planter. It looked great with how it was used. But I just could never see how using a toilet for a planter looks nice. In case someone disagrees with me, to each their own. We don’t all have to have the same tastes, haha. Wow, what a great commentary on the Christian life. God see’s into our hearts not on what is on the outside. He gut’s us (like your bathroom)and remodels us (creates in us a new heart) and it is not always quick or easy and sometimes we have detours (fixing another leak) along the way. Soon the outside (bathroom paraphernalia) will be cleaned up and start to reflect the inside (new bathroom) and we not be able to hide our lights for Christ to all who see us! Create in me a new (clean) heart! I find this very encouraging, actually. Hopefully I can handle similar situations with such grace. I see the wall to the garage and a bit of backyard when I look out my kitchen window. Oh, and the trash and recycling bins and the leftover platform that used to be a makeshift greenhouse for the former owners to grow marijuana. So perhaps I do have a bit of grace in these situations? HAHAHAHAHAHAHA!!!! You have such a way with words. Love it!!! I actually am looking at snow too here in North GA. We got about 4 inches for the first time in a couple years I guess. It is beautiful but…. I like warm sunny weather. Anxious to see the finished bathroom remodel. After almost 10 yrs. of seeing the side of my neighbors house out of my kitchen window, the Lord saw fit to allow us to move. The view now? Trees, fields, and birds-lots and lots of beautiful birds. My children yell several times a week that there is a bird they can’t identify. My son even commented on how neat it was that God made all of these beautiful birds for us to enjoy! This brings me back to the verse in Ephesians about how God gives us above all that we ask or think! What an amazing blessing and what an amazing Creator! I could SO relate to this, Laura….having that precious morning time with the Lord…..gazing out at the beauty of His created world and also seeing the beauty of the loving gifts our husbands so willingly (and sacrificially) provide for us and our families. I love how you write and I love what you write…from your heart with gratitude and humor. May God continue to richly bless you all! It took me a little to put 2 & 2 together, “What’s up with the toilet?” and the bright picture looking out the window… Then I had to chuckle- we have the same view! Kind of comforting to know that there’s other wives with handy husbands getting projects done in the winter -which is wonderful!- and they are reminded every time they look out a certain window and see that toilet sitting there because, yes, it is snowy, and they weight a ton and that’s all the further dear hubby got with them! 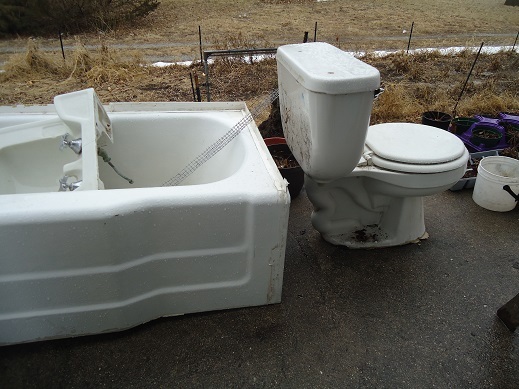 It’ll be nice when spring gets here so that old toilets can be properly disposed of… and for other reasons too!!! I can’t think how to utilize the toilet, though I have seen them used as flower containers, but in my back yard I have an old bathtub where I grow my SALAD. I use it all summer long. I don’t have to bend down so far, and it’s large enough to hold a nice selection of basic greens. In the winter I put a snowman in the tub like he is taking a bubble bath. I look out the window and see 4 feet of snow… with more coming down now. It’s beautiful, but I think I’d rather see a toilet. I am so done with this winter. I am HOPING that in the summer I will be able to look out into my backyard and see my kids happily playing on a new-to-us swingset! Yes, I’ll think about that rather than all the snow. I see my GARAGE! Which I am so grateful for this snowy winter. This is so amusing! Laura I love your daily laughs-they are a big highlight of my morning. Being in Australia, they come through early hours of the morning and are sitting in my inbox first thing. Always makes me smile, and reminds me to enjoy all the simple and fun things that happen in my life with my baby girl and hubby. It’s been a hard week, but you made me laugh today! That’s hilarious! Growing up dad had several toilets lined up in the yard with plants and rose bushes in them and we even got “Yard of the Month”. LOL! Very funny. The first thing I noticed after the toilet was that you can see grass!! All we see is white snow everywhere. How amazing that you have grass! We aren’t sure if we still even have grass :-) It’s been 2 months since we’ve seen it. Some day soon we hope to see it again. Okay, we are shooting for April I think :-). I live I a city and on my block, houses are only about 6-7 feet apart. Believe it or not, from my kitchen, I can look out and see into….my neighbor’s bathroom!! Thankfully they have frosted windows! I see snow on the deck, railings and the grill. Past that, it’s snow in the yard. Eventually, it’s snow in the woods. Since the snow is probably still 25″-30″ deep, if someone had put bathroom fixtures out there early enough, I might not be able to see them! They’d either be covered up or blend right in.